Kiosk Browser is designed to replace the default launcher on the device, once set as the default it can only be unset by entering the device admin password. 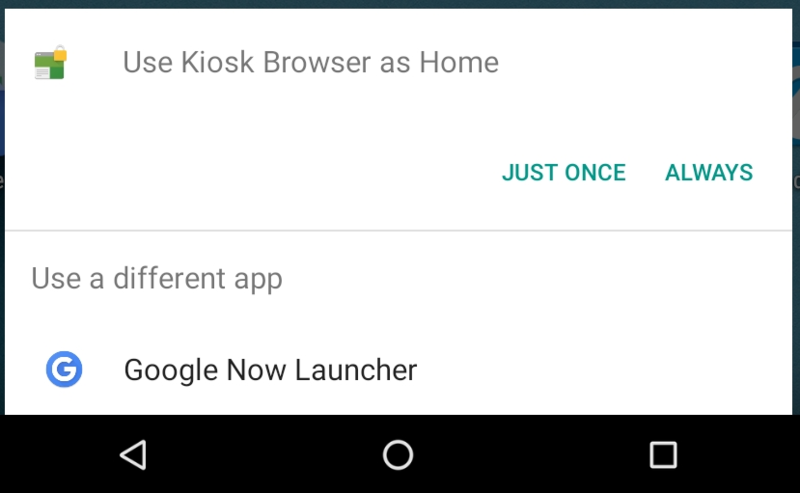 As all Android devices have the potential to behave differently we do not suggest you set Kiosk Browser as the default launcher until you have tested gaining access to the settings screen. Turning off/rebooting the device by tapping "Exit to launcher" this will always cause this behaviour, it is by design. To turn off/reboot the device you should tap Settings, enter the password and then power the device off as normal (hold down power button until power off menu appears). Note if you have a Samsung device running Android 6.0 or higher you may need to set the default launcher manually via Android Settings > Applications > Default Applications > Home Screen OR on newer Samsung devices, you may need to go to Android Settings > Apps> Kiosk Browser > Home Screen then select Kiosk Browser. If you want your end users to be able to reboot the device please see this article.